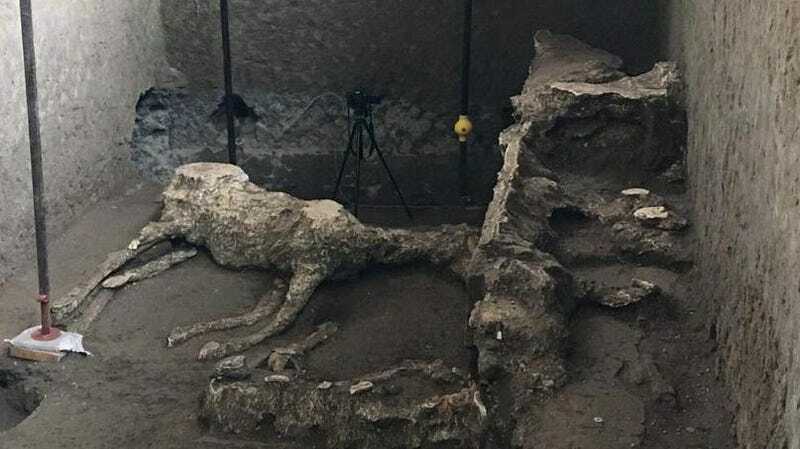 The remains of a horse, with its harness and saddle still attached, have been uncovered at the Villa of Mysteries at Pompeii Archaeological Park in Italy, the BBC reports. The formerly luxurious villa is a well-preserved suburban estate on the outskirts of Pompeii that once overlooked the sea. Massimo Osanna, the director general of the park, said the horse likely belonged to a high-ranking military officer, possibly a general, or a high-ranking military magistrate. In 79 AD, Mount Vesuvius erupted, peppering the ancient Roman city with ash and rock. A dense, fast-moving cloud of hot gas and debris locked many of its victims in their final death position. Thousands of residents were killed during the eruption, many of whom were trying to flee. Indeed, the condition of the newly discovered horse, with its harness and saddle attached, suggests the animal was being prepared for the evacuation. Along with the saddle and harness, archaeologists found fragments of wooden and bronze trimmings, in addition to two other thoroughbred horses, according to the BBC. The Villa of Mysteries and its stable was located along the northern outskirts of the city. Like many of Pompeii’s inhabitants, the horses likely suffered a “fierce and terrible end,” in the words of Osanna, suffocating from the falling ash and hot, noxious clouds of volcanic gas.